The year 2016 was probably the best year South Korean cinema had this decade in terms of quality, with a plethora of productions leaving their mark on the industry, both locally and internationally. 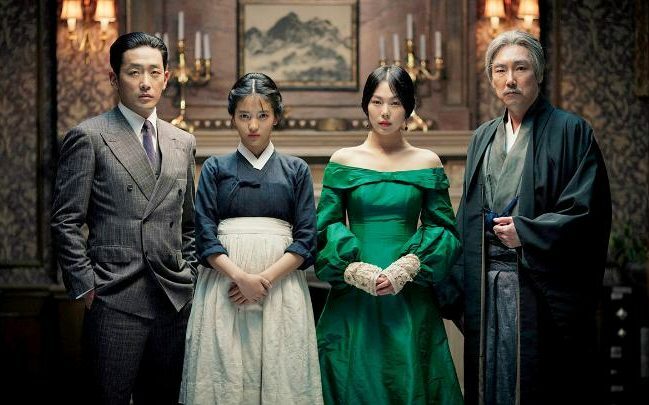 One of the biggest events was Park Chan-wook’s return to his country after his “trip” to Hollywood, with “The Handmaiden” being one of the most hailed productions of 2016, all over the world. The tendency to criticize authorities, institutions, corruption, and history continued, and this year it went blockbuster, with “The Tunnel,” “Inside Men” and “Asura: City of Madness”, while “The Wailing” took the road of allegory to criticize the government and at the same time presented an extraordinary horror film. 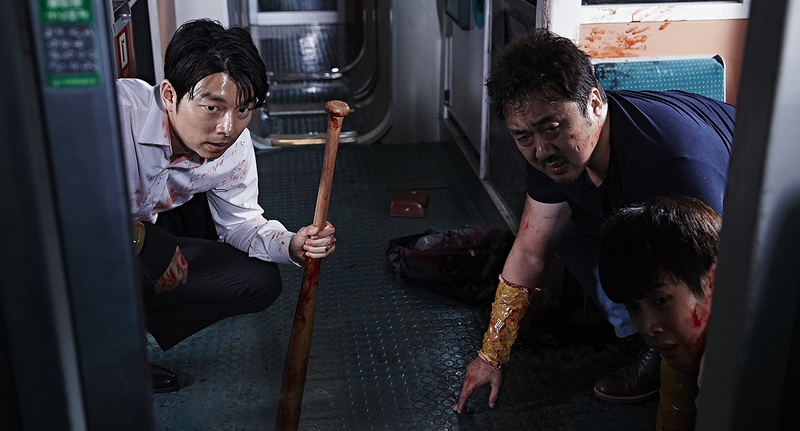 “Train to Busan” proved that South Koreans can also shoot great zombie films, and the audience rewarded it, placing the film in the 11th position in the domestic films with most admissions table. “Age of Shadows”, headed by another great performance by Song Kang-ho and the return of Kim Jee-woon from Hollywood, was the official selection for the Best Foreign Language Film Oscar. “The Bacchus Lady” looked into a very difficult but very real subject of Korean society, “Dongju: The Portrait of a Poet” is an impressive biopic, and “Derailed” a great indie production. Some films may have premiered in 2015, but since this occurred at the end of the year, I took the liberty of including them. With a focus on diversity, here are the 10 best South Korean films of 2016. Lee Jung-soo is an executive who deals with car contracts. As he is on his way to his home for his daughter’s birthday, he passes through a tunnel that crosses a mountain. Unfortunately, the tunnel collapses and Jung-soo finds himself buried under tons of concrete, with only his car saving him from being crushed. However, as soon as he regains consciousness, he manages to call the authorities. As he realizes that he only has two bottles of water and his daughter’s birthday cake to survive, a rescue crew arrives at the location in order to extract him. Unfortunately, along with them, the press and a number of politicians also arrive, and soon after, the fact that his rescue will not be easy at all is revealed. His wife, Se-hyun, also arrives at the place, and Dae-kyung, who is in charge of the rescue team, does his best to save him. However, as the days pass, the construction company and the families of the workers on the site insist on stopping the mission. Kim Sung-hoon directs a film that makes some plain accusations. He accuses construction companies of being purposefully neglectful in their work in order to avoid costs, and for being inhumane in the face of profit. He accuses the press for being utterly insensitive, only caring about their ratings. Lastly, he accuses politicians of being hypocrites and the state for not being organized. Apart from that, the film moves somewhere between drama and agonizing thriller, while Kim also injects some moments of humor, mainly presented by Oh Dal-su, who plays Dae-kyung, and a dog that eventually appears in the story to steal the show. Ha Jung-woo gives a very entertaining performance as Lee Jung-soo, portraying his character’s changes of mentality with elaborateness. Doona Bae has a minor part, mostly focusing on the dramatic aspect of the film. The special effects are on a very high level, particularly during the scenes where the catastrophe ensues. The film is set at the end of the 1920s in Korea, during the Japanese occupation. Lee Jung-chool is a Korean working for the Japanese police, whose mission is to uncover members of the Resistance, and particularly Kim Woo-jin, one of its central figures. Lee has some successes, but the Japanese do not fully trust him, and attach to him Hashimoto, supposedly as his assistant, but actually as the man in charge. In this power struggle, both sides use their moles and their informants, and a series of events take place that lead Lee and Kim to meet, although neither of them reveal that he knows the other’s identity. Soon, the scenery changes as all the players move to Shanghai, where the members of the Resistance have moved to avoid investigations and to obtain explosives. Kim soon tricks Lee into a meeting with the leader of the Resistance, Jung Chae-san, and now Lee has to choose sides, as he is blackmailed by the Koreans and suspected by the Japanese. A deadly cat-and-mouse game initiates. Kim Jee-woon directs and pens a spy thriller that also combines elements of film noir with action and drama. There is also a minor romantic concept, but it’s not actually examined at all, since women are definitely in the background. The script is quite elaborate, with constant betrayals and changes in the upper hand, as spies fight against other spies. These notions are chiefly materialized through Lee Jung-chool’s character, who incorporates all of them. In terms of direction, the film is a true masterpiece. Kim creates a great atmosphere that is shaped through a number of “confrontations”, usually between two characters, with the ones between Lee and Kim standing apart. The noir element is chiefly present in these scenes. The highlight of his direction, though, is the sequence on the train, where he manages to retain the agony through an astonishing number of events, which occur in spite of the restricted space. The bloody finale of these events is another highlight of the film. Song Kang-ho is great as always as Lee Jung-chool, in a very difficult role that demands a constant state of inner struggle. His chemistry with Kim Jee-woon, which has been shaped through three previous collaborations (“The Quiet Family”, “The Foul King”, “The Good, The Bad The Weird”) is quite evident, and one of the biggest assets of the film. Seok-woo is a fund manager in Seoul, who has separated from his wife and now lives with his young daughter, Su-an. Obsessed with money and his work, Seok-woo has been neglecting his family for years. However, he finally succumbs to his daughter’s wish to bring her to her mother, in Busan, for her birthday. The next morning, they take the KTX train from Seoul station to Busan, but shortly before the train leaves, a zombified woman manages to get on the train, and soon spreads the virus to the whole of the train. Now, Seok-woo and Su-an have to survive in the infested train, while they are soon joined by Sang-hwa and his pregnant wife, Sung-gyeong, and a baseball player named Yong-guk, who is looking for his girlfriend, Jin-hee. At the same time, Yong-suk, another businessman, and a bunch of other passengers have secluded themselves in the wagon, and are unwilling to let anyone else in. Yeon Sang-ho directs a film that definitely moves toward being a blockbuster, but manages to induce it with a number of elements that make it much more meaningful than the majority of zombie and action films. The elaborate script, which retains the agony as it switches genres from action to drama, is a definite factor, as is the case with the injections of humor, which occasionally occur through chaos. The meaningful allegories regarding socio-political issues also move in that direction. However, despite all this depth, “Train to Busan” is first and foremost a very impressive action film. Starting with the zombies, which follow the rules of Danny Boyle’s “28 Days Later” and are actually very quick, and adding the claustrophobic environment of the train, the result is one of the most agonizing depictions we’ve ever seen of the creatures. Furthermore, the scenes where they crash into each other as they are speeding towards their prey are utterly horrific, although the one that truly stands apart occurs when they form a mass of sorts in order to stop a moving train. The acting element in zombie movies is usually on a very low level, since the genre tends to focus on the action and the creatures rather than the actual actors. However, Yeon Sang-ho used a different tactic, since the film also features much drama and the occasional comedy, which demands good acting, at least to some degree. The film revolves around the intricate, and is filled with corruption and the relationships of five men. Lee Kang-hee is the chief editor at a large newspaper, who has helped an ex-prosecutor (Jang Pil-woo) rise to the parliament. The former currently provides the necessary publicity, and the latter the political power. The financing comes from President Oh, the owner of a large company that provides for both Jang and the newspaper. 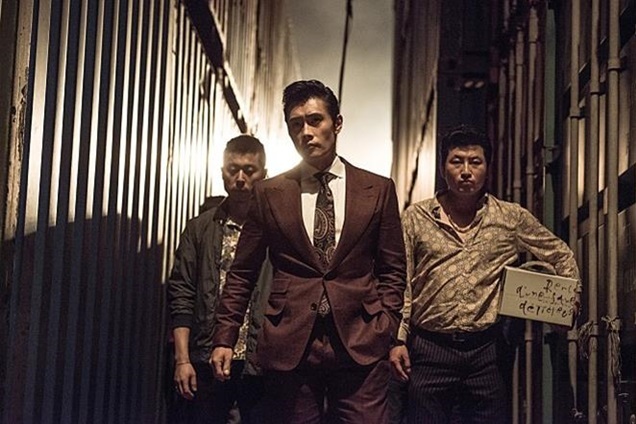 An Sang-goo is a gangster that gets into business with Lee as his enforcer, at least until he is deemed a traitor. Lastly, Woo Jang-hoon, one of the few honest prosecutors, has set his life goal to putting Jang behind bars. Unfortunately, he has no connections to help him and has to face the combined forces of the press, the industry, and the politicians. However, he finds an unlikely ally in An, who is set to exact revenge. Woo Min-ho makes a clear comment regarding corruption in the country, and the connection of the judiciary with the press and the politicians. He paints all the individuals of the aforementioned institutions with the darkest colours, to the point that even a mob man like An Sang-goo looks honest and good in comparison. This depiction stretches beyond their corruption, as they are also presented as sexual deviants. The film keeps a good pace, and despite its long duration, it manages to retain the interest unwaveringly. The story unfolds in segments, and between them are inserted flashbacks that further explain the situation. In that aspect, considering the script is quite complex, the movie demands full attention from the spectator, a task than can be difficult considering its duration. However, both the outcome and the unfolding of the story fully compensate. Lee Byung-hun as An Sang-goo is the undisputed star of the film, as he manages, once more, to appear smooth and stylish in every scene. His depiction of a tough but sensitive criminal is sublime. Cho Seung-woo is also great as Woo Hang-hoon, a “lone ranger” that has to forget everything he believes in order to achieve his goal. The chemistry between the two of them is one of the film biggest assets. Baek Yoon-sik as Lee Kang-hee and Lee Kyoung-young as Jang Pil-woo provide two great villains, who are corrupt as they are intelligent and calculating. Also of note is the presence of Jo Woo-jin as Director Jo, the torturer of the syndicate, who acts in distinct exploitation fashion. The script revolves around four teenagers (two couples actually), Jin-il, Ga-yeong, Bong-gil, and Min-kyung, who have run away from their homes, and try to survive by selling stolen goods that range from mobile phones to cars. Jin-il is the leader of the group, and the one who actually takes care of the others. Their lives are quite hard, as there are times that they do not even have money to get a place to sleep. In order to cope, they plan crimes that are even more daring. When they stumble upon Hyung-seok, a karaoke owner who traps underage girls and uses them as prostitutes, their lives take a turn for the even worse. Their interaction ends with Ga-yeong being forced to work for him and Jin-il desperately trying to find money to free her. Furthermore, Ga-yeong’s ex-boyfriend, a true sociopath, is released from prison and is after her. Lee Seong-tae, in his first feature film, pens and directs a movie about the cruelty and despair caused by the megalopolis, an environment where “being nice means being stupid,” as it is stated in the beginning of the film. In these harsh circumstances, the four youths try to survive and take care of each other, but they cannot find any other way except becoming criminals. Eventually, it is revealed that the same applies even for Hyung-Seok, who has fallen victim to bad financial advice, and has to succumb to his particular line of work in order to support his daughter and calm his neurotic wife. The fact that he feels that, in order to show his daughter he loves her, he has to give her money, is a clear indication of the guilt he experiences, as well as his awkwardness at expressing his feelings while retaining his thug persona outside his home. In these circumstances, everyone is a victim but no one is a saint, since all of the main characters exploit others to survive. Lee presents clear messages; people have both good and evil inside them, and they manifest according to the circumstances. Love of any kind (for family, for friends, for a significant other) is not a pure sentiment, but one that can lead people to do harm to anyone that comes across them. The acting is on a very high level. Minho is great as Jin-il, as he expresses his continuous agony to take care of everyone around him without any kind of support from anyone. Ma Dong-seok is impressive as both a cruel thug and a tender father, while exemplifying the fact that he is another victim of the times. Lastly, Kim Jae-young is great as the sociopathic villain who feels no remorse whatsoever.